At Pure Skin Spa, we believe that regular pampering makes life a little brighter. And we offer exclusive packages for you to beautify, relax, and indulge. This treatment will leave your skin silky smooth and deeply hydrated. First, we use a dry brush to sweep away dead skin cells and improve circulation. Then, we use a gentle sugar scrub infused with natural oils to further exfoliate your skin. We apply the scrub in soothing, rhythmic strokes to help you sink into a state of deep relaxation. Once you’ve been thoroughly exfoliated, we carefully remove every trace of the scrub with a warm towel and buffing cloth. We finish by massaging in a rich, hydrating body butter to leave you silky smooth and radiant from head to toe. Soften, hydrate, and nourish your skin with the Pure Hydration Body Wrap. We start off with a dry brushing technique to buff away dull, dry skin and improve circulation. 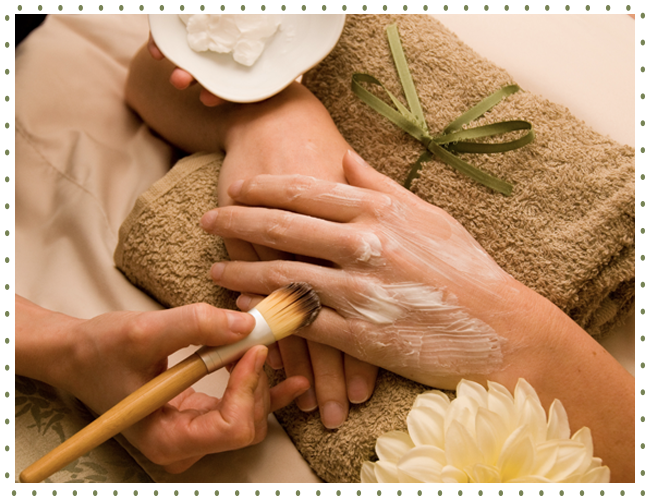 Next, we use soothing, rhythmic strokes to massage your skin with a hydrating sugar scrub infused with natural oils. The scrub further exfoliates your skin, while the application technique helps release tension so you can relax. Once we’ve swept away all evidence of rough, dry skin, we use a warm towel and buffing cloth to remove the sugar scrub. We finish by massing in a warm, hydrating body butter and wrapping you carefully so that the hydrating nutrients can penetrate deeply. While your skin drinks in the moisture, we perform a soothing scalp massage with warm essential oils. You’re left smooth and glowing from head to toe. We eliminate acne and clogged pores by treating your back with the same care you’ll find in our Pure Complexion Facial. First, we analyze the skin on your back to come up with a customized mix of products and techniques for maximum results. Then, we use a dry brush to sweep away dead skin cells and improve circulation. We prep your skin with a relaxing pre-cleansing treatment, and we follow up with a deep hydrating cleanse. Once skin is cleansed and purified, we use our enzyme-antioxidant exfoliation treatment to further refine the skin. We perform careful extractions to get rid of blemishes, and we finish the treatment by applying a masque packed full of powerful ingredients to restore balance to your skin. You’ll feel relaxed and ready to show off flawless skin after this treatment.